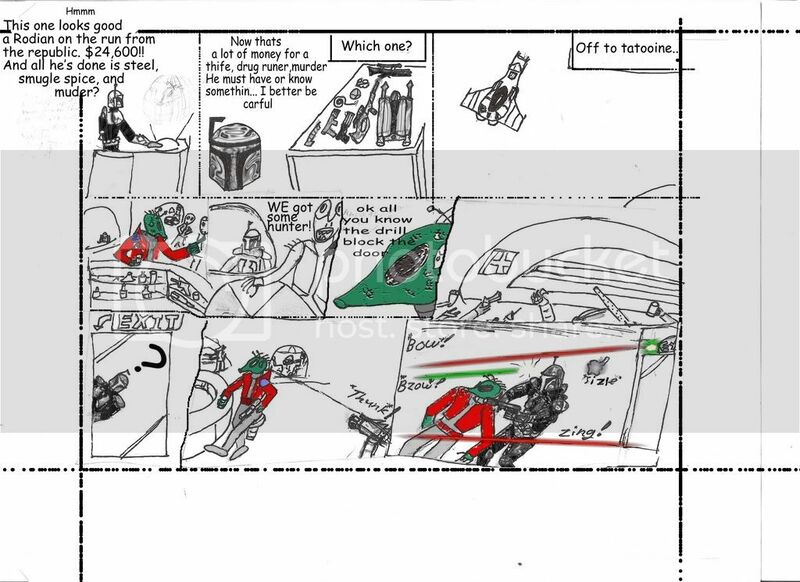 this is for anyone who has a cartoon or comic abot star wars/Boba. I did a serch and I think I saw topics LIKE this one but they were all for one person this is for all. Here is one that I'm working on It's not even close to being done so don't ask any stupid questions like: Where did all the color... "Hey, where did all the color go??!!" sorry if you can't read the talk you might have to save it and then zoom if you explorer can't zoom. some of my stuff from back in the day. i like ur rodian and the dialog. and i dig the angles you took with some of the frames. im a tragic speller, and this will fix ur typos. AND I DON"T CARE IF I'M "DOUBLE POSTING"!!! If this topic was dead, and you had something new to share, then there would be a reason for double posting. What you did was spam. Anyways, Cujo is right in that you could use a spell-checker. Other than that, it is good . Where is it? I don't see a button. This site does not have a spell-checker, but I'm sure many programmes such as or similar to the one Alo used do. On starwars.com the have one.....Aaron could make one of those. i like the bar with the blaster under the table. and yes the spelling is off I use adobe for the typing so there is no spell check but I should still use a program with it cu'z (as you all well know) my spelling is hoarid. Take an art class, you hack! Just kidding, I appreciate my bro's work, seeing that I have know artictic ability, save in writing.